Yes we meet again. Now the winter is coming and Moscow is getting colder by days. The temperature drops till -15 degrees Celsius! Can you imagine how cold we are? But we still have to go to class and face the cold wind and make ourselves just like a polar bear! 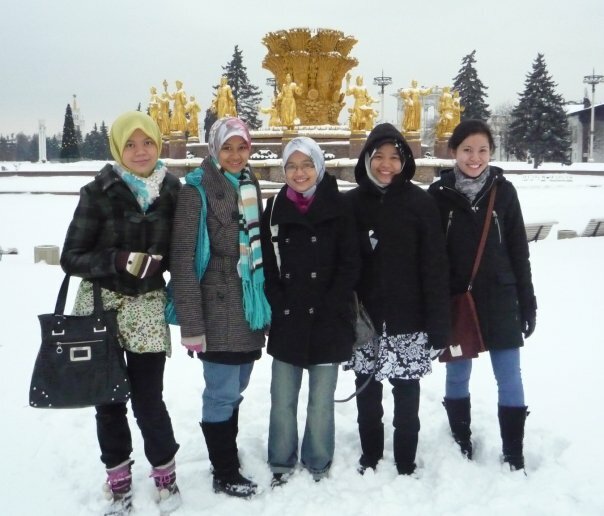 Haha.. With high boots, muffler, snow cap, and 2-3 layers of clothes around the body, we found it just interesting. No other places in the world that I can experience this kind of weather and surroundings except for Russia. Well, it is Russian Winter. About a month ago, one of Russian newspaper (Russia Today) announced that this year will be the coldest winter in 1000 years! Waah.. it sounds unbelievable right! People can only predict but the Most Powerful to make this happens or not is Him! If He says not gonna happen, it will not. That is what I always say. People’s power cannot overcome His’ whatever efforts they try to put on. After all, this will be my last winter in Moscow. I cannot experience any winter season after this. So, I want to maximize my life here with Russian Winter. Do any activities that can make them forever in my heart and become the unforgettable memories for the rest of my life. This season makes me tougher and stronger to face the real life. InsyaAllah if I become a doctor, wherever area I will be posting, I will survive as I survive the Russian Winter for 6 years here. InsyaAllah.